At Tribal Impact, we have a philosophy that to successfully activate employees on social media they need three things to support them. The first is training. They need to know why, how and what to do when they get themselves online. There’s no bigger roadblock than unconfident employees, who lack purpose and direction on social media. The next thing we consider is content. We agree with the industry recommendation of 4:1 when sharing. Four pieces of content being external third party and one being a branded piece of content. This keeps the focus on educating, not broadcasting. Last is the tool which is implemented in line with the employee advocacy program. The tool is an important player and can bring the whole effort to the point of success or failure. In this post I want to focus mostly on the second and third criteria, the content and the tool. Diving into the factors which make up a successful programme and sharing the things you need to consider when managing your advocacy tool. The first thing I want to talk about is the fact that any successful tool is nothing without the people behind it. As with any internal programme, without someone keeping an eye on it and overseeing it from a holistic point of view, it’s likely to be doomed to the ‘nice try but not quite’ project pile. It’s important for a person (myself for Tribal), or a small team, to own the tool from the outset. We are the ones who know what the tool is being used for in the larger business context. We need to understand the type of content that’s needed in the tool, where it should come from and what the employees will do with it. It’s our role to constantly review and tweak. Any tool left to flounder without this human input will ultimately fail because humans work in so many different ways. In different businesses, there's no one way of doing things that will work long-term and the tool usage and setup needs ongoing management. Action: Make sure someone takes charge, ideally someone who is passionate about both your company and employee advocacy, so they can envision the whole social business journey. Trust in them to keep your tool alive. It may seem like a time-saving idea to import content feeds into your tool and, in a way, it’s an efficient way to get regular and useful content into your platform. However, it’s not without its issues such as content which doesn’t suit your advocacy user’s needs and content repetition from various social profile feeds, as well as issues with titles, pictures and content excerpts. Take for instance on one of the feeds I import into the Tribal Impact account every time the symbol ‘ is used int the text, our tool replaces it with a &#8217; not very user friendly you’d agree? Thus I regularly check the excerpts before approving them. You also need to consider that an imported feed won’t be able to double check the quality of the content, nor will it be able to add it to the right category or add a comment if necessary. Basically feeds are great, but they require someone like me to be a human moderator to make sure the content is adding value to the platform rather than detracting from it. 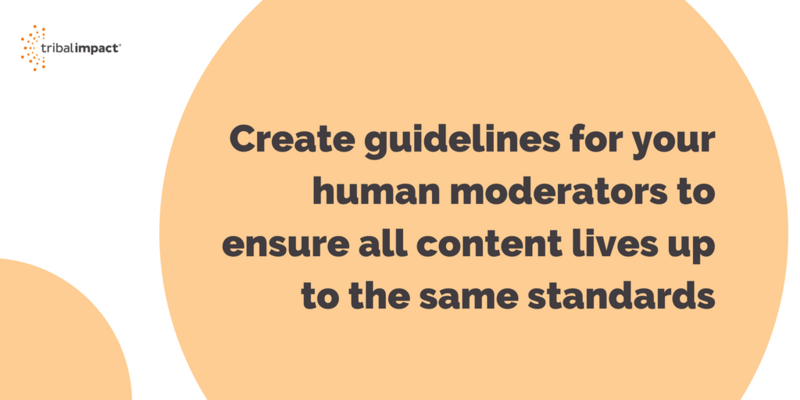 Action: Decide how much of your content will be automated and create guidelines for your human moderators to ensure all content lives up to the same standards. Within Tribal I encourage users to share into our tool and thankfully the tribe often rises to the occasion. However, something I also watch out for is too much content going out from any one person at any one time. From a submission point of view, it’s great that I get a lot of content in one go as it ensures I have a wide pool of content to approve from, but on the side of the user perspective it can give the impression that the platform doesn’t have a variety of voices or content in it to share out. I believe the ideal scenario is to provide a fresh feed of content to the user each time they log in. This is where I see the approval queue becoming your best friend. My approval queue allows me to store articles, ready for publication, allowing me to focus on approving content across our categories and from different submitters. I find as long as you communicate to your team you do this, they don’t get discouraged from submitting and you can create a great user experience each time. Lastly, to support content submission into the platform, you can have one member of the team (or the admins) who gather content on a weekly basis from sources such as Google Alerts or Flipboard to share directly into the platform. This is one of my main roles in overseeing the advocacy tool within SMARP, but my team don’t always want to see my name at the top of posts. This is where other members can support you in creating a more human experience. 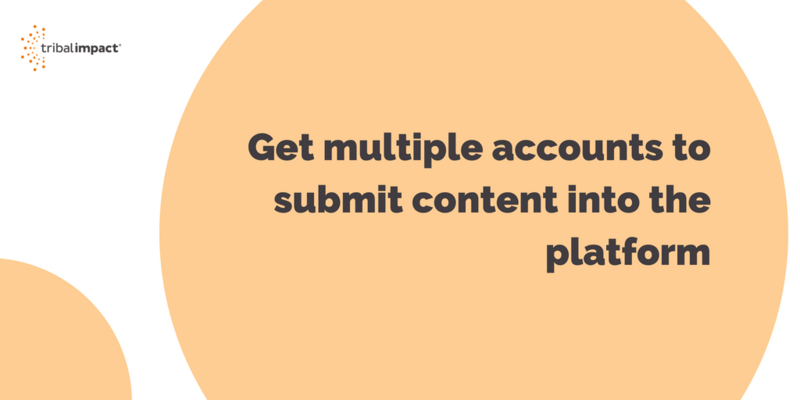 Action: Get different accounts to submit content into the platform to ensure no one admin account monopolises the feed. N.B: Some of these features will differ per platform but can be adapted as necessary. What goes into your tool is what comes out. This may sound obvious, but tool administrators need to think about what happens to the content after our users share it out of the platform. What type of content should the team be sharing? For Tribal, we want to encourage our team to talk about employee advocacy and social business, which are the more obvious topics, but we also want them to share around online teams, work/life balance and productivity, as these are topics which mean a lot to us as a remote company. Are there topics we don’t want them to share because they don’t align with our company goals? We tend to lean away from content around managing social accounts and changing jobs. I’m not suggesting in any way that we place any restrictions on what our employees can share but I do suggest you take a conscious effort to provide content around the subject areas your business aligns with. This shouldn’t be far from what your employees personal branding topics are anyway. If a user requests certain content, you can assess at any time whether it’s a topic you want to cultivate within the tool or not. Actually this kind of feedback is perfect for keeping the tool relevant. It’s also important to check the content within the tool is of a high quality, because we are relying on feeds and user submissions. We have to keep an eye on what types of content are appearing in our platforms. Generally this shouldn’t be a problem but, for example, click-bait sounding titles can leave a sour taste in your users' mouths. I have a checklist of what I look for and make sure to check it off each time. Action: Cross your T’s and dot your I’s on the quality of the content in your tool. Trust me, it will take your programme up a level. A tool which isn’t aligned to your business goals isn’t going to feed back into your bottom line and ultimately that is what is going to fund it. At Tribal Impact, we focus on end to end tracking, so we show this in action. When considering your tool and,more specifically your categories, think about what the core areas of your business are and which may be of interest to your users and customers. What topic areas do your PR team refer to regularly? What are your HR and development teams passionate about? What are your experts on the ground interested in? What are they talking about in the break room? If you don’t know, I’d suggest going to have some conversations with them. I know my team were happy to share what websites they visited regularly and what topics they were passionate about. Once you have a full list, start putting this information into your tool's categories. 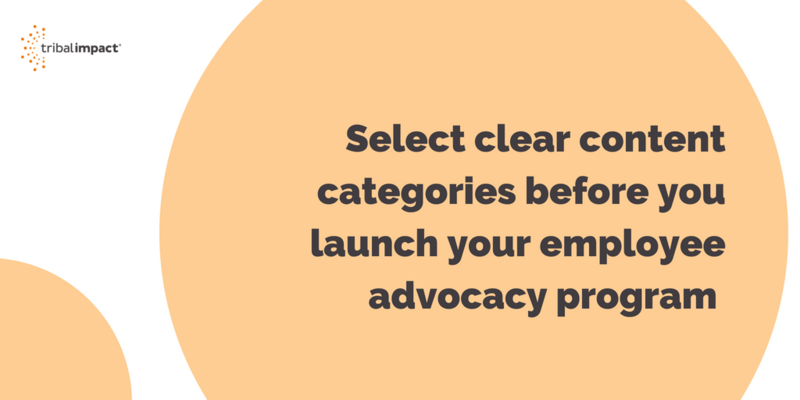 Ideally you want 10 or less categories in your employee advocacy tool, because more than that is too much for a user to search through and you need to keep their attention at all costs. I use five categories, with an additional general category for the content which doesn’t fit within our main five. We use Business Blogging, Employee Advocacy, Inbound & Social Media Marketing, Social Selling, and Tribal Culture. However as we grow I will undoubtably change these. Action: With a large-scale business, it’s vital to select clear and relevant categories before you roll out. Also remember it’s never too late to update these. Whilst running an employee advocacy tool, training is a task I never finish. With more people joining our team, I need to train new members and even re-train older members. This can normally be done with a recording explaining the platform, but I also make sure to reach out to individual members and ask how they are progressing with it. Sometimes a standard training video won’t answer the questions your tool users have and sometimes being on hand to help answer those answers is key to getting them using the tool from the start. If I can get them to establish a regular habit by engaging 1-2-1 then I want to be doing that. In Tribal, one of my tribe members was unsure how they could use both our internal tool and an external tool, so after some research and talking to the team, I figured out how the process would work best for both them and for Tribal. Employees want to do it right, so I make sure I’m there to help them do so. Action: Train and check back in on a regular basis. Be proactive rather than reactive. At the end of the day, I need to report back to my project lead about how the project is faring. To do this I need to understand whether all this time and effort I’ve been putting into the tool, and the bigger employee advocacy picture, is getting the results Tribal Impact wants. Tracking is essential for this. Most tools enable you to connect any traffic from content shared out of your advocacy tool back to your website and the more digitally savvy companies can even track which traffic then converts into a lead or sale. We do this by ensuring all content shared out by employees comes from within our tool and then, on a monthly basis, we look to see what traffic has come from employee shares. At the very least, as an employee advocacy programme leader, you need to be able to show the tool is driving more traffic to the company website via its employees. Action: Get your UTM tracking URLs working. Make sure your employees are sharing from the tool and lastly create regular reports to understand which employees are performing the best. This will often show you who your internal influencers are. 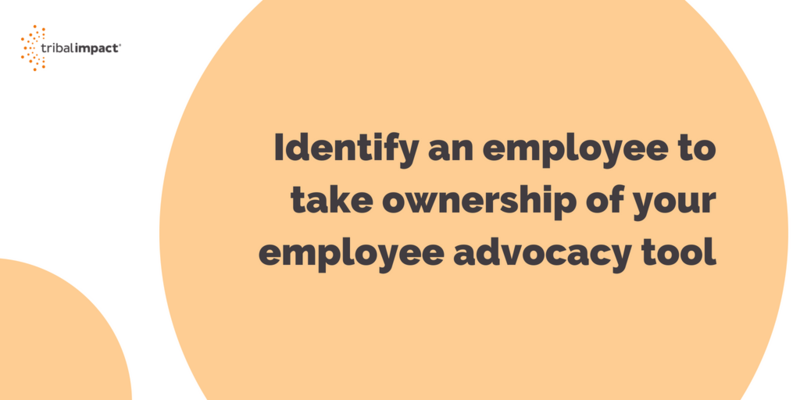 These are just some of the ongoing tasks I have found an employee advocacy tool manager needs to consider on a daily basis. Some feed back into an excellent user experience, whilst others can be directly reported back into a company’s bottom line. Any other considerations I haven’t covered?